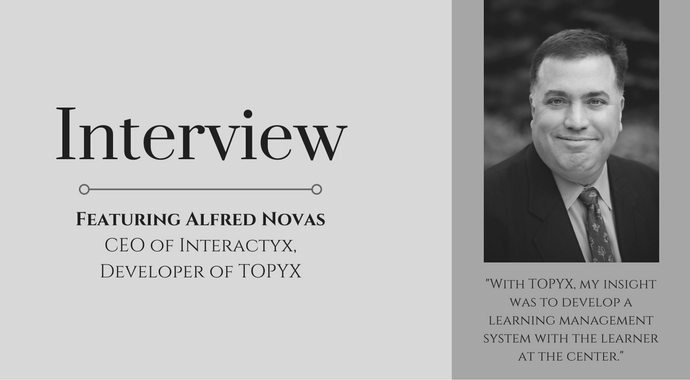 Featured among an elite roster of CEOs heading up some of Florida’s fastest growing businesses, CEO of Interactyx, Alfred Novas, reveals the inspiration behind his company’s award-winning learning management system, TOPYX. As shared during the interview with GrowFL, TOPYX was one of the first LMS providers to recognize the importance of peer-to-peer social learning in an online environment. "With TOPYX, my insight was to develop a learning management system with the learner at the center of the equation." Further differentiating the company’s LMS offering is its pricing model. TOPYX clients, which include global brands and large associations and nonprofits, gain the unique ability to grow and expand eLearning throughout their entire organization without any additional user or maintenance fees. This is unique in the LMS market where most software providers charge on a per seat (user) basis. A true Software as a Service (SaaS) offering, TOPYX technology is supported with full service, which includes dedicated account management for every client. The resulting value proposition clearly resonates in the marketplace. Launched in 2009, the TOPYX eLearning platform is relied upon by leading brands worldwide and has been honored with prestigious industry awards for eight consecutive years. What can other entrepreneurs learn from Novas’ experience? Among the wisdom shared is the importance of steadiness in the ability to persevere through the highs and lows of a growing company. Read the full interview on GrowFL.